So far, the facebook page for the Los Angeles version of this shutdown is only showing 135 confirmed participants. I'll guess that there will be more attending than that; 1,525 were invited by Occupy LA. 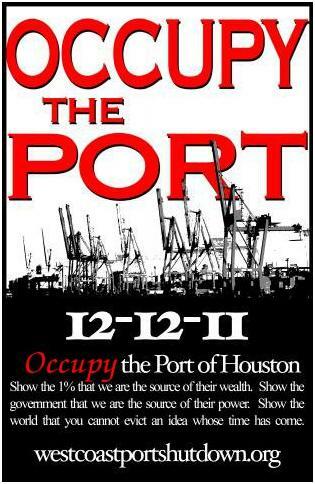 Occupy Los Angeles and Long Beach will carry out a port action, "Occupy the Ports/A Day without Goldman Sachs," on December 12 as part of the Dec. 12 day of action, Boycott and March previously adopted by the GA. The occupation will take place at at least one facility owned by SSA Marine, a shipping company belonging to Goldman Sachs, (coordinated with a possible port shut down by the port truck drivers) as a build up towards a General Strike on May 1, 2012. The General Strike Preparation Committee of Occupy LA, will work with the Dec. 12 Coalition, port truck drivers, longshore, warehouse and other port workers, community residents, unions, and Occupy Long Beach to plan and organize the Dec. 12 actions. We will develop alliances in the process with organized and unorganized labor, student and community groups to prepare for and build towards a General Strike on May 1, 2012, or at any moment that circumstances and conditions demand. We call on other Occupations to act on Dec. 12 and May 1. The 1% are depriving port truck drivers and other workers of decent pay, working conditions and the right to organize, even while the port of LA/LB is the largest in the US and a huge engine of profits for the 1%. The 1% have pursued a conscious policy of de-industrialization that has resulted in "trade" at the port meaning that there are 7 containers coming in for every one going out. The 1% have driven migrant workers into a "grey market" economy and repression. The 1% use police brutality and repression, jails and prisons to suppress, divide and try to silence the 99% and all who oppose their insatiable greed. To put an end to all that, we call on the 99% to march, boycott, occupy the ports, and STRIKE on December 12 for full legalization, good jobs for all, equality and justice. After the Occupy the Ports/A Day Without Goldman Sachs action, OccupyLA will be mobilizing people to the downtown March and Boycott. So, as you can see for yourself, not only are they planning a shutdown today, but they are also planning for another port shutdown or a general strike on May 1st (note the name of the website in this link) or "or at any moment that circumstances and conditions demand." Thank goodness that's clear. While they complain about their perceived injustices heaped on these poor port workers by the "evil, rich, and greedy 1%," I guess they don't bother to consider that by shutting down these ports, the workers will be going without more than half a day of pay. (Shutdown is scheduled for 5AM -10AM PST) Once again within the occupy movement no common sense applies. Why shut down the West Coast Ports? The ports play a pivotal role in the flow and growth of capital for the 1% in this country and internationally. For that reason alone it is the ideal place to disrupt their profit machine. The workers on these ports have always understood that; they have consistently staged shutdowns for political reasons, honored community picket lines, and led the labor movement. A general disruption of commerce, in protest of the nationally coordinated attacks on Occupy movements alone is warranted, but additionally, the specifically targeted attacks on workers at these ports by the 1% further necessitate this call to action. Truck drivers on ports in southern California were fired in a union busting attack when they attempted an organizing campaign. Workers, especially in the Latino community, are organizing a “stay away” to withhold labor on December 12, the day of Our Virgin Of Guadalupe. Occupy LA voted to also blockade the SSA ports, owned by Goldman Sachs. 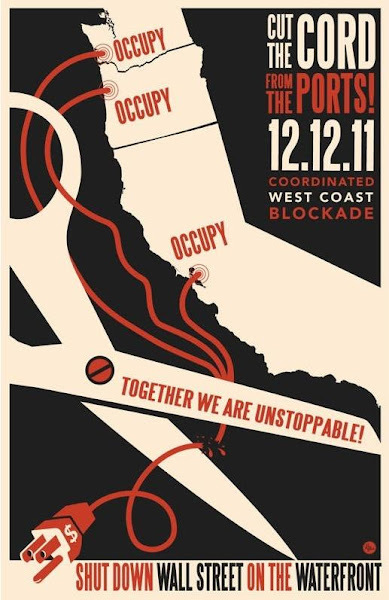 In solidarity, Occupy Oakland voted unanimously to expand this call to all of the West Coast ports. After tens of thousands shut down the port of Oakland in solidarity with ILWU Local 21 in Longview, Washington’s struggle against EGT, the first ship still approaches the port. The workers and their families have been beaten, pepper sprayed, and arrested by police armed with tear gas, rubber and live ammunitions, in order to protect EGT’s flow of capital. The power of the workers to act collectively to disrupt production on the ports will be seriously compromised by any penetration of the ILWU’s West Coast stronghold. If EGT is successful, other ports may follow and these attacks could spread to other worker organizations. As the ILWU motto states, “An injury to one is an injury to all!” We must show that workers will not tolerate attacks on ourselves, our families, or our communities. We will maintain our collective power and right to organize. In that blog post I included 17 videos from YouTube that display the type of behavior that one can expect from the group of people that will be taking part in the port blockade later today. I strongly urge you to check out at least a few of those videos so you have some idea of how quickly today's blockade could get out of hand. These are not civil or peaceful people. Actions are planned in every major west coast port city, plus Houston, TX; blockades of Walmart distribution centers in Salt Lake City, Denver, and more. There will be two rallies near the port at 3pm and 6pm at the Spokane Street fishing area, just to the east of the Spokane St. bridge, near the intersection of SW Spokane St & SW Manning St. under the West Seattle bridge. Isn't it nice of them to screw with shipments to Wal-Mart? Where NINETY-NINE PERCENT of the country shops! Two weeks before CHRISTMAS! They're such a thoughtful bunch. Dig in, gang. These "99ers" aren't going anywhere. You may want to think about stocking up a little extra food...before they TAKE OVER the ports and distribution centers this coming Spring and Summer. I would "stock-up" but I'm lucky to be able to afford ANY food, as is. Thanks 99ers. Thanks for looking out for "one of your own." Please, stop thinking you're doing us any favors. You do not speak for me. Nor do you speak for about 90% of the country. Someone should donate a calculator to your cause.